While I love reading DIY posts, I rarely try making anything myself. Most times, I don't feel too confident about applying the end-product on my skin (happens mostly with DIY face packs). Body scrubs, though, are a whole different story. I have extremely dry skin, and oil-based scrubs are my saviors. I tend to stock up on huge tubs of scrubs every sale season, but once the initial enthusiasm of using a new product fades off, I forget all about it and discover half-empty expired products during one of my cleaning sprees. With one too many tubs tossed out, I figured it's about time I tried my hand at cooking up a DIY body scrub. 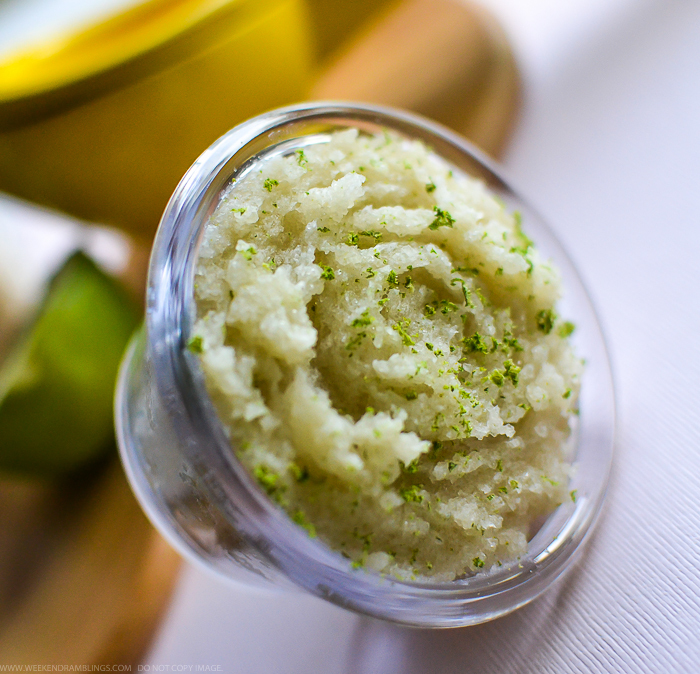 And if like me, you like trying out new body scrubs every other week, then give this easy DIY single-serve body scrub a try. It's made with sugar, coconut oil, and is bursting with citrusy goodness of lime zest and juice. Makes enough for a single use. What you need to make this single-serve scrub: About 1/4 cup of granulated sugar. About 2-3 tablespoons of coconut oil. If the coconut oil has hardened (as haappens in colder climates), heat the oil in a microwave safe bowl for about 10 seconds to liquefy it. You can also place the bowl in hot water to melt the oil. Avoid using this scrub if you believe you are sensitive or allergic to any of the ingredients. In a mixing bowl, add sugar and some lime zest (1). Bigger the size of the sugar particles, the coarser the scrub will turn out. Adjust according to your preference. 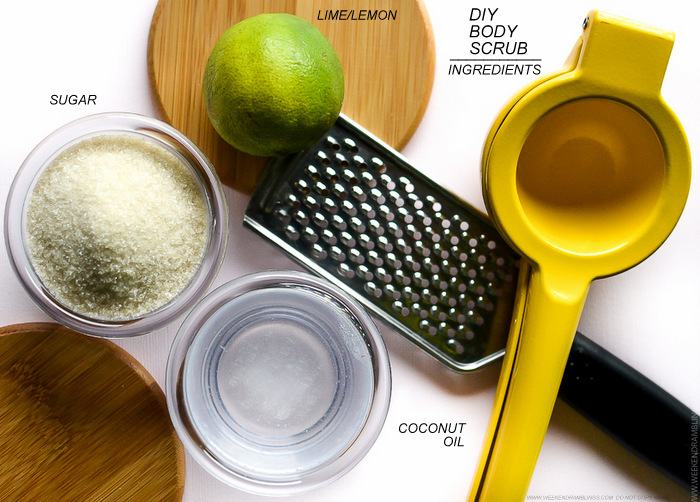 The lime zest gives a burst of freshness to the scrub. Add coconut oil to the sugar, starting with 1 tablespoon. The amount of oil added should just wet the sugar without any extra oil floating around (2). 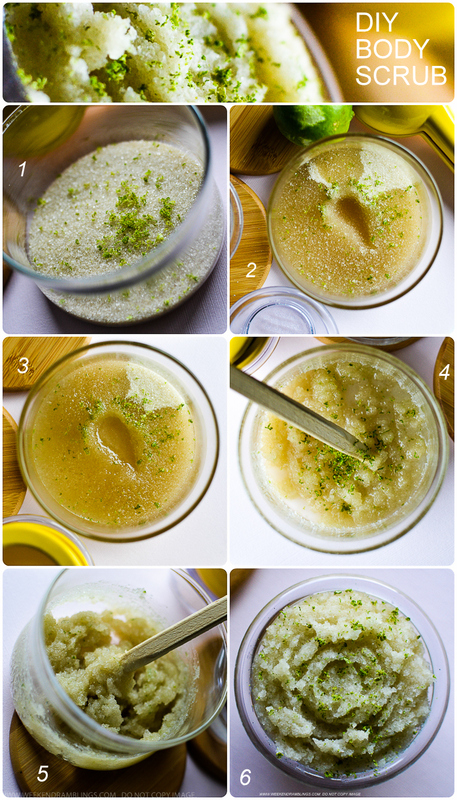 Add in the lime juice (3). Depending on the size of the lime/lemons adjust the amount you would use - about 2 tablespoons should do. Mix everything together (4). Check if you need more oil - I needed to add about another tablespoon - and I also added in a bit more of the lime zest. Stir to mix (5) and transfer to a smaller container (6). 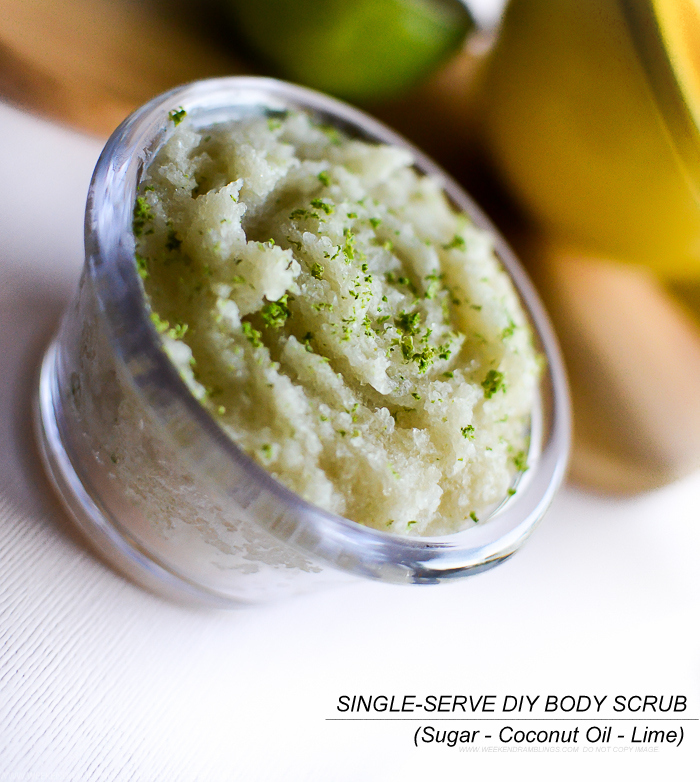 And that's the finished sugar-coconut-lime scrub. I like to keep the consistency dryish, with no extra oil floating around. Even then, this is a greasy scrub and does leave a bit of oil on the skin - not too much as the lime juice does help with washing off some of the oil and some of it gets absorbed while patting dry with a towel. The scrub smells fabulous thanks to the lemon zest - smell doesn't linger on the skin, though - and my skin feels super smooth. I don't need to follow up with a moisturizer, either. The amount of sugar I have listed (about 1/4 cup) makes enough scrub for a single use. There are no preservatives in the scrub, and it has fresh lime juice, so I would recommend using it up the same day that you make it. Note: The scrub will leave an oily residue on floor/bath tub, making it quite slippery. Take care not to slip and fall (and the bathroom/tub will need to be cleaned out - I rely on Scrubbing Bubbles).